UPDATED: Tue., Aug. 15, 2017, 6:27 p.m. The biggest surprise from the first week of the NFL preseason might be former Eastern Washington wide receiver Kendrick Bourne. Will that be enough for Bourne to earn a roster spot this fall? Time will tell, but his stock has never been higher after he caught four passes for 88 yards and a touchdown in the San Francisco 49ers’ 27-17 win Friday over Kansas City. The experts noticed, putting Bourne on the season’s first Pro Football Focus team of the week. However, Bourne still faces an uphill battle to make the 53-man regular-season roster. 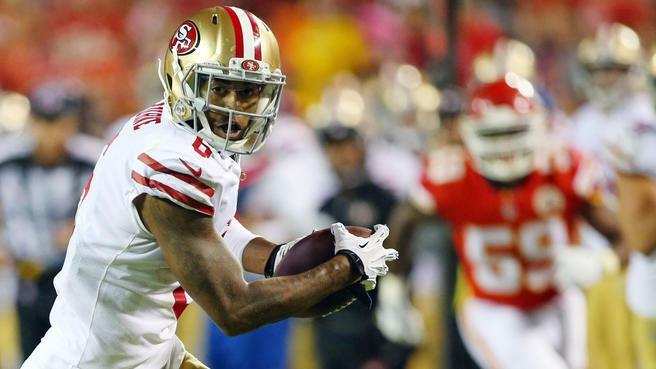 San Francisco is expected to keep just six receivers. Five of them – Pierre Garcon, Marquise Goodwin, Aldrick Robinson, Jeremy Kerley and Trent Taylor – are almost locks, according to NBC Sports. Half a dozen others are competing with Bourne for the other spot. Long odds are nothing new for Bourne, who was lightly recruited out of high school in Portland before landing at Eastern. In four years in Cheney, Bourne caught 211 balls for 2,199 yards and 27 touchdowns, but still managed to be overshadowed by Kupp. That didn’t happen last weekend, though Kupp also scored on a fumble recovery to help the Rams beat Dallas. Bourne was hurt this year not only by a slow 40 time at the NFL Combine, but by an NFL rule that prohibits rookies from fully participating in workouts until the final day of exams at their school. That kept Bourne on the sidelines until mid-June. However, the 6-foot-3 Bourne brings length to an otherwise Smurf-ish group, which boosts his chances. That was on display when Bourne outleaped a Chiefs defender on a two-point conversion. The highlight was a 46-yard touchdown that was largely created by Bourne thinking outside the box. Bourne was supposed to begin his route outside the cornerback on the left side. However, the corner was aligned in such a way that Bourne had to go inside. Quarterback C.J. Beathard recognized the ad-lib and found Bourne open for the score. If Bourne keeps this up, he might be saying the same thing on opening day. Published: Aug. 15, 2017, 11:01 a.m. Updated: Aug. 15, 2017, 6:27 p.m.